This week's online research tool is actually a pair of websites: the Making of America project, hosted by both Cornell University Library and the University of Michigan. In short, Making of America is "a digital library of primary sources in American social history from the antebellum period through reconstruction." Both sites contain different texts, so if you search in one, make sure to search in the other as well. Perhaps the most significant aspect of these sites is the access they provide to a wide range of important nineteenth century journals - to list a few: Appleton's, DeBow's, Harper's New Monthly Magazine, The Century, and Scientific American. As such, it is a phenomenal research tool for all those working in the nineteenth century. If you've found any online research tools that you'd like to share with the world, leave a comment. The American Studies blog will be back in 2008 - Happy New Year to you all. 2007 isn't over yet, but you'd be forgiven for thinking so if you've been paying attention to the internet for the past couple of weeks. As has now become customary, in December the online world is dominated by lists attempting to encapsulate the year just gone. Here's a selection of lists examining various aspects of 2007's cultural output. First, books. The New York Times offers both its 10 Best Books of 2007 and its 100 Notable Books; Salon presents its 2007 Book Awards; and Publisher's Weekly lists its Best Books of 2007. When it comes to music, one site has it covered. Largehearted Boy is again engaged in the quixotic task of tracking down every online 2007 music list here. One of the newer cultural weathervanes is the annual search-engine list. Yahoo presents its top ten most-searched-for here; Google has announced the search terms that have been the fastest rising in 2007 (with a definitive list to follow); Lycos offers a variety of most-searched lists here. Alternatively, Entertainment Weekly reveals its most-searched-for here. And finally: two dictionary companies have announced their words of 2007. OUP and the New Oxford American Dictionary have gone for "locavore"; Merriam-Webster, meanwhile, are riding the zeitgeist with "w00t." Have you come across any compelling year-end lists? Let us know in the comments. This is the first post in an ongoing endeavour to highlight useful research tools and websites of interest to those of us in the American Studies field. If you look in the sidebar to the right, you can see that there are two links already in existence. The first is a link to the British Association for American Studies. The second is a link to one of the only other American Studies blogs in existence, The Atlantic Community, run by graduate students based in Denmark who got in touch through the blog. Both, in their own way, contain much that is of interest. But we need more, and so the challenge is thrown open to you. Have you come across a website or a research tool that you think others should know about? Let us know in the comments or via e-mail, and we'll feature them in the weeks to come. To get the ball rolling, this week the spotlight falls on JStor. Perhaps Jstor needs no introduction, since it is arguably the leading online journal website. But if you haven't yet come across it in your research, you're missing a trick. For those working in the field of American Studies, it provides access to an important list of scholarly, peer-reviewed journals, including American Literature and the Journal of American History. What's more, unlike other online journal hosts, what you'll see is an image of the original journal page, so it's a good as seeing a hard copy. If you're on campus, you have full access. If you're off campus, you can access the site with an Athens password. If you don't yet have one, then ask for one at the library. A reminder that at this week's special end-of-semester research seminar, Will Kaufman from the University of Central Lancashire, author of The Civil War in American Culture (Edinburgh University Press, 2007), will be performing his acclaimed presentation, "Woody Guthrie: Hard Times and Hard Travellin', A Musical History." As ever, all are very welcome, but please note: this is a ticketed event. Tickets are free, but must be presented for entry on the night as numbers are limited. They can be requested from Phyllida Scrivens on 01953 593564, or at p.scrivens@uea.ac.uk. Please also note the change of date and venue for this event: Thursday, December 13, John Jarrold Room, UEA Sportspark, 4pm. "While studying at Georgetown University in Washington D.C. I had the opportunity to do an internship in the U.S. House of Representatives. 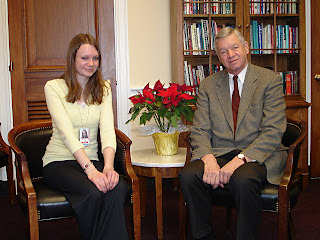 I spent my Thursdays and Fridays for four months interning in the office of Representative Tom Petri from Wisconsin. I and five other interns did the usual intern tasks of answering the phone, replying to constituent mail, archiving letters and other material from the past two decades that the Congressman has been serving the house and giving tours of the U.S. Capitol building. Giving tours of the Capitol building was particularly interesting and amusing at times since I had to apologise a number of times for the British burning down the original building in 1814! My internship was such a great way to really see law making and politics in action. I got to find out a lot about how party politics and elections worked, as I started my internship just four days into the new 2007-2008 Democratic House. In addition, I got to attend one of the Congressman’s fundraisers, and see how the financial side of politics is important. I also got to learn a lot about American culture and the views of Americans through my conversations with constituents back in Wisconsin. It was especially interesting to learn their views on the war in Iraq and terrorism. About half-way through my internship President Bush proposed the troop surge in Iraq and the House put together a non-binding resolution (a statement not a law) declaring their objection. Congressmen Petri was one of only 17 Republicans to vote in favour of the Resolution. The heated response from his constituents and local party were amazing, but the numbers enthusiastically supporting him were quite remarkable too. Towards the end of my internship the Congressman took several of the staff, including me, on a tour of the dome of the Capitol building. You have to have a member of Congress with you to go on these tours so it was a really unique chance to see more of one of the world’s most famous landmarks. Altogether it was an amazing opportunity and made such a difference to my studies of America." You're already able to subscribe to this blog via its RSS feed (which means, if you're at the UEA, you can subscribe through the Portal). As ever, all are welcome: Wednesday, December 5, Arts 2.51, 4pm. Plus: advance notice about next week's research seminar. 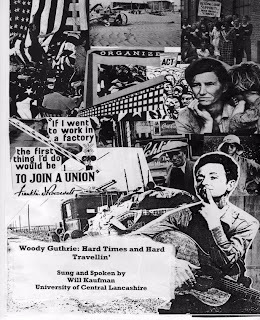 In an end-of-semester spectacular, Will Kaufman from the University of Central Lancashire will be performing his one-man presentation, 'Woody Guthrie: Hard Times and Hard Travellin'.' Will has attracted praise from the likes of Tom Paxton and Pete Seeger, and this promises to be quite a special show. As such, the event is going to be ticketed. Tickets are free, but must be presented for entry on the night as numbers are limited. They can be requested from Phyllida Scrivens on 01953 593564, or at p.scrivens@uea.ac.uk. Please note the change of date and venue for this event: Thursday, December 13, John Jarrold Room, UEA Sportspark, 4pm. All welcome. This week saw the U.S. Naval Academy in Annapolis play host to a potentially historic Middle East peace conference, featuring the participation of over 40 countries. Now that is over, the assessments are beginning. ...and The Times provides the text of the Annapolis agreement here. The New York Times editorial strikes a cautiously optimistic tone: "We are encouraged that President Bush [...] has finally accepted the challenge of peacemaker." But Michael Oren, also writing in the New York Times, judges that "the chances for any progress emerging from Annapolis seem at best remote." And Fred Kaplan, writing for Slate, ponders a missed opportunity for Condoleezza Rice and George Bush here. Finally, CBS asks, "Now What?" Have you stumbled across any compelling assessments of the Annapolis Conference? If so, let us know about it in the comments. With thanks to AMS student Tong Xiong.